The Essay. The Key That Opens The Door To The College Of Your Choice! Yes. The college essay. Striking fear into the hearts of college-bound students and their shell-shocked parents. Have no fear. College Connection is here! If the eyes are the windows to the soul, then your college essay is the reflection of your life, at least in the eyes of the college admissions counselor, who must distinguish you from thousands of other highly qualified applicants. What will set you apart? Your GPA? Test scores? Extracurriculars? Perhaps. It is your essay, however, that gives the folks at the college admissions office a glimpse at the real you, beyond that screen shot matrix of grades, scores, references, and after-school activities. The essay is your one chance to shine, to stand above the crowd, to impress, and, quite frankly, to give you the edge over the other guy or gal, whose stats, background, and all those other mundane factors look so very much like your own. So, how's your college essay coming along? Is it up to snuff? Have you even given it a thought? At College Connection, we can help you develop a theme, weave a story, create a vivid image, and meld it all together -- yes, in 650 words or less -- into that perfect essay. The one that really describes who you are and what you're all about, in your own immutable voice. What you say and how you say it really do make a difference! So what are you waiting for? 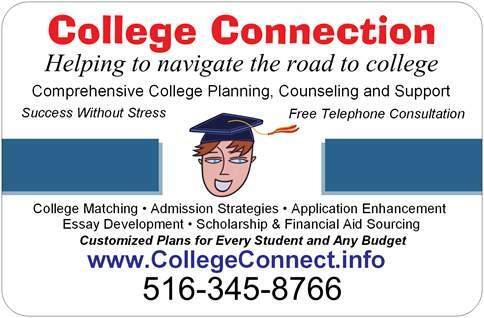 Call College Connection TODAY at 516-345-8766, and take your essay from drab and dismal to daring and dapper. Together, we'll turn the ordinary into the extraordinary, and give you the competitive advantage!